While at Dell OEM day, we got to see Scott Hanson’s new Dell Inspiron Duo notebook / tablet. 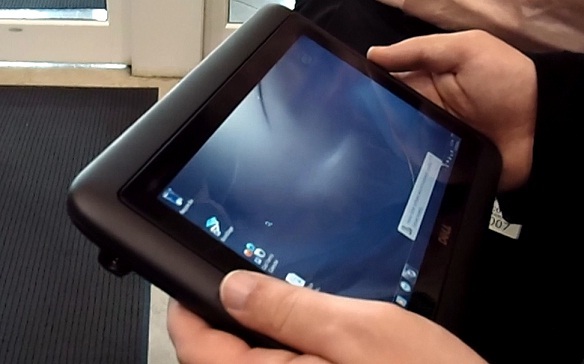 A pretty nice idea – flip the screen and turn the notebook into a touchscreen device. But the question is if it’s a functional device. The machine we looked at had a ATOM Duo 1.4 GHz N550 processor, 320 GB hard drive (SATA, not SSD), 2 GB memory and a 10″ screen. The weight on the machine was 2-3x that of an iPad. We got to play with the DUO for a short time, but I wasn’t really impressed with the machine. To begin with, I am not a big fan of the ATOM processor. It doesn’t seem to work as well, even as a dual core. I always seem to be waiting if I am multi-tasking. The flip to tablet form takes a while and you might get errors as you flip it. Like I said, the device is pretty heavy, so its not a good alternative to an iPad. The result: a decent device, but way too heavy. No SSD and ATOM processor means a slower experience. But if you want to keep it low in price, you have to give up some things. Give this machine a year and with a shed of half it’s weight and an SSD, it should be a great option.